Kelvin Gastelum’s reaction to Robert Whittaker’s emergency bowel and hernia surgery, which cancelled their middleweight championship fight at UFC 234 on Saturday in Melbourne, Australia, was to parade around on television and in the arena, holding a title belt and proclaiming himself as champion. Gastelum was holding the belt owned by flyweight champion Henry Cejudo. On one hand, given Whittaker undergoing a serious operation that very day, it was probably the worst timing to be proclaiming himself as champion. On the other hand, he probably felt pressured to do something, because even though he had been set for a championship match and the match fell apart having nothing to do with him, things change in the UFC on a daily basis. In fact, they changed that very day. Israel Adesanya defeated Anderson Silva in the main event. In doing so, Adesanya came off as a bigger star than Gastelum. If you combine the fact Adesanya is now 16-0, and the title picture in UFC is often heavily star driven, he could easily get the next shot at Whittaker. There will probably be more interest in Adesanya vs. Whittaker than the Gastelum match that had been planned for several months. Saturday’s show itself was a mixed bag. The UFC got lucky for a second time in two shows on ESPN with an exciting prelim undercard, which immediately followed the Duke vs. Virginia basketball game, giving UFC a big audience lead-in. While the names weren’t the biggest, the Teruto Ishihara vs. Kyung Ho Kang fight was an entertaining brawl that ended in a late first-round submission. Devonte Smith scored a quick knockout over Dong Hyun Ma, while Austin Arnett and Shane Young also had a great fight. The pay-per-view was more of a mixed bag. From a star power standpoint it was incredibly thin. Adesanya vs. Silva, which was the scheduled No. 2 fight, probably had more interest than the Whittaker-Gastelum main event because of the legendary status of Silva and the intrigue surrounding Adesanya. It was put together as something of a passing of the torch fight and in that sense, it delivered. Adesanya clearly won, but at 43, Silva looked like he would at least be competitive with many of the fighters in the middleweight division. Let’s look at how fortunes changed for five fighters on Saturday’s show. 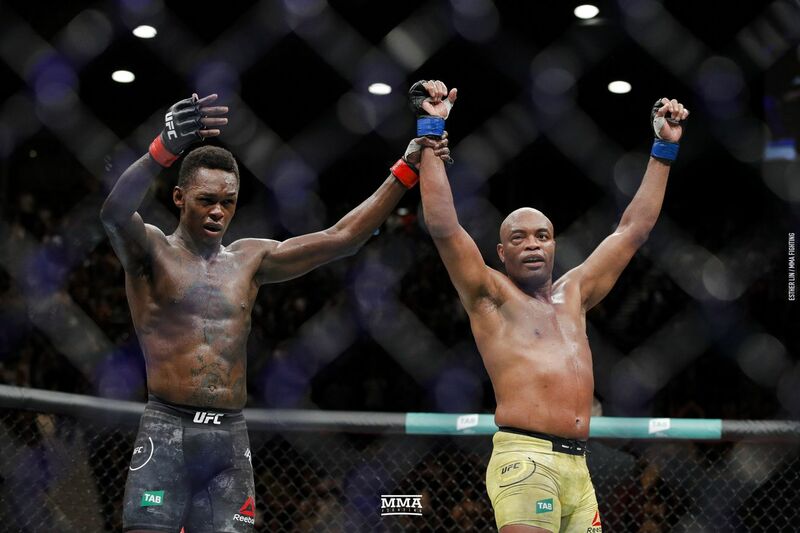 ISRAEL ADESANYA – “The Last Stylebender” could end up facing Whittaker next, although given the seriousness of Whittaker’s surgery and the situation with Gastelum deserving a shot, he may have to win one more fight. If that’s the case, the best opponents would be Ronaldo “Jacare” Souza (26-6) or the winner of the Yoel Romero (14-3) and Paulo Costa (12-0) fight on April 27. ANDERSON SILVA – Silva (34-9 with one no contest) is likely near the end of his career. But after the fight, he talked about perhaps facing Conor McGregor or Nick Diaz. The size difference makes the McGregor fight ridiculous, but there probably would be intrigue due to the difference in age versus the difference in size. But there are other opponents for McGregor in the lightweight division, rather than going the freak show route. Diaz, who hasn’t fought in several years, seems to have no interest in fighting. The biggest fight Silva could probably do without it being somewhat of a mockery, would be with Georges St-Pierre (26-2). St-Pierre never seemed to be into it when both were in their prime. The fight wouldn’t be nearly as big now as it would’ve been years ago and there is a weight class question since St-Pierre compromised his health, moving up to middleweight when he defeated Michael Bisping to become champion. There is also the question of whether St-Pierre is even interested in fighting again. RICKY SIMON – Simon (15-1) is coming off a decision win over Rani Yahya (26-10, 1 no contest). His record alone makes him close to a championship contender at bantamweight. A good next opponent would be John Lineker (31-8). MONTANA DE LA ROSA – De La Rosa (10-4) scored a big win in the relatively new women’s flyweight division. A good next opponent for her would be Roxanne Modafferi (22-15). KAI KARA-FRANCE – Kara-France scored a second straight win in UFC competition on Saturday with a close split-decision over Raulian Paiva (18-2). The fight may have come down to a Kara-France takedown with seconds left in what appeared to be the deciding third round. Still, reporters scored at MMADecisions.com had 63 percent for Paiva. A good next opponent for France in a division that nobody knows the future of would be Alexandre Pantoja (20-3).